There’s nothing sweeter than watching your kid discover the joy and pride that come from lending a hand to others. 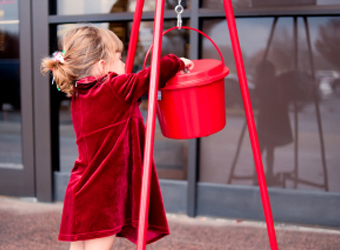 Here are three great ways kids can give back this holiday season and beyond. Prior to a weekend playdate, have your child go through his old, too-small clothes and “baby” toys and put together a bag of donations. Ask his friends who are coming over to do the same, then drop off the goodies together at a community center or church that can use the items. Afterward, celebrate back home with a special playdate treat and discuss what the coolest part of the activity was—looking through and reminiscing about old toys? Seeing the smiling faces of the people who received the donations? Brainstorm what other fun “give back” activities they’d like to do. Put volunteering on the calendar as a family activity, just like sports or movie nights, and you can’t help but raise children who’ll grow into giving, compassionate adults with concern for their communities. Not sure which organizations allow children to help? At The Volunteer Family (thevolunteerfamily.org), you can search for organizations in your area that accept volunteer families (read: helpers of all ages), and sign up for projects. It couldn’t be easier to get out there together and lend a hand. The Volunteer Family also runs the “Future Philanthropists” program to help youth develop their own charitable efforts in their communities; see www.futurephilanthropists.org. With her 6th birthday on the horizon, my colleague’s daughter told her mom she’d rather give than receive. Rather than presents, she asked her party guests to bring items needed by her charity of choice—The Humane Association—like cat and dog food, litter, and towels. Part of the fun involved a film screening: Marmaduke. The kids had a blast and couldn’t stop talking about helping animals. For your child’s next birthday, talk to her about various charities and non-profits and let her pick her favorite. Then match the party theme—treats, decorations, and entertainment—to the chosen charity. Contact the organization beforehand; they might have promotional freebies, like stickers or tote bags, that kids can take home in lieu of goodie bags. We just had a give not get birthday party. People were asked top bring some spare change and we lined it up on the floor...150' of mixed change equaled $114.76 to the March of Dimes. It was so much fun that our five year old has already said that's what he's doing for his birthday!! Nice to hear about your personal give not get experience. Sounds like everyone had fun and you raised money for the March of Dimes at the same time. You can't beat that! Glad to hear your son wants to continue the spirit of giving for his birthday.